for attending our annual 2018 holiday tree lighting celebration! We loved celebrating this “very merry” Boca tradition! This past holiday season, attendees enjoyed a fun-filled evening with holiday performances by local choirs and carolers, photos with Santa, letters to Santa and more! General admission was free with the donation of a new, unwrapped toy for Spirit of Giving. VIP tickets included valet parking, open bar for those 21+, lite bites from TAP42 and Rocco’s Taco’s, fast lane access to Santa and cannoli decorating for kids! 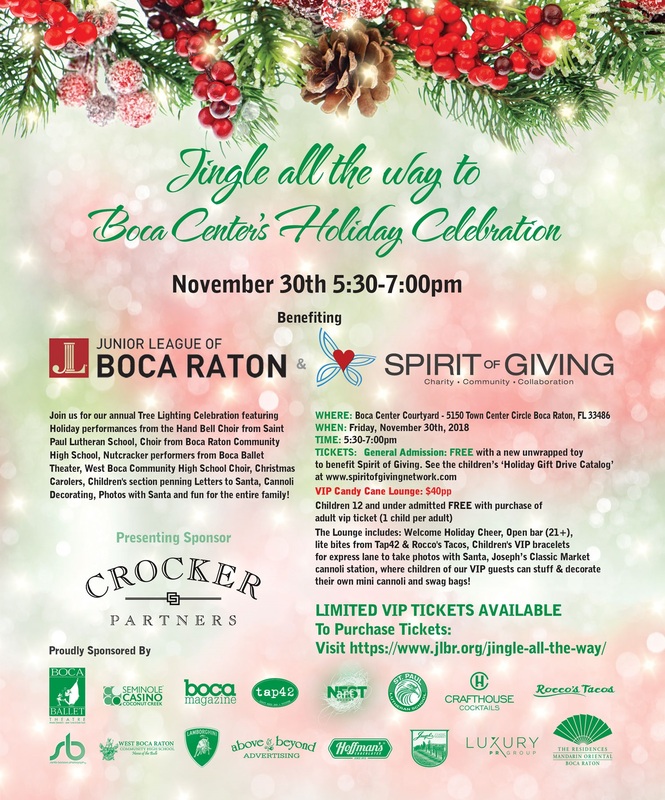 100% of VIP ticket sales benefitted the Junior League of Boca Raton.